MatchSeniors is targeted at senior singles aged 50+, and has one goal: setting men and women up to help them find love by using online dating. Unlike other online dating sites for seniors, the way they achieve this goal can vary, depending on age, location, and what users are looking for in a match. There really is something for everyone here. If users are looking for a second chance at love after a loss or a breakup, or simply want to meet new people and try the phenomenon which is online dating, MatchSeniors is a smart place to begin. 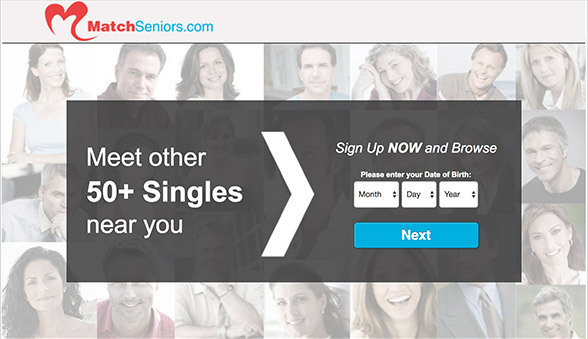 Because MatchSeniors works with partner dating websites, each user experience can vary. Take some time to think about how to make the best out of the features which are on offer. For example, some dating websites include video and audio chat, while others stick to inbox messaging and email. Some have offline events, or matchmaking options. Because MatchSeniors pairs with the top dating sites in the area, users can be confident that they are receiving the best offer to help them find what they are looking for. Another interesting element of MatchSeniors is their offline matchmaking service. This combines what’s great about online dating (the dating pool) with offline human contacts who can meet singles, chat with them, and find out what they’re looking for. Users will need to sign up to see whether matchmakers are available in their area. If they are, contact will be initiated automatically. Users will need to answer a few questions before they get started using the dating websites. These include name, age, location and what you’re looking for. Usually, location will be used to help choose the right dating website. However, in certain cases, if it’s clear that users are looking for something more niche, they can be redirected to a website with less users, but more opportunity. A common partner site which is chosen is Match.com, as well as FirstMet. Both of these have hundreds of thousands of monthly users and great reputations. If you are currently attached and still looking to meet people, you might be referred to Ashley Madison for example. Or if the users age is higher than the dating pool average, perhaps they will be prompted to join a site such as SeniorPeopleMeet. Again, safety features will vary from website to website. Ideally, the website will offer top security features, including ID authentication by either email, phone number or even video. Other safety extras to look out for are blocklists, private mode of browsing, and of course SSL security for all payments. If the site allows payment by PayPal - even better. Most sites will have extensive safety tips or guidance on meeting people online. These are usually found on the home page at the bottom of the screen. Take the time to read these before you start reaching out to new people or making any offline dates. Some dating websites offer a free trial, or a reduced price for checking out the site for a few days. Others might offer some features for free, typically sign up and browse, and then charge when users are ready to communicate with their matches or other singles on the site. It is common for the cost to reduce the longer you sign up for, with a 6 month deal costing less than 1 month for example. Some sites offer a money back guarantee if users haven’t met anyone within the term of their subscription. You can’t say fairer than that. Most dating sites start at around $20 per month. If they have mobile apps, this will be included in the price. It only takes a minute or two to find out which matchmaking and online dating options are available in your area. Everything is done step by step with red error messages if any mistakes are made, so that they are easy to fix. Including your email address means that you won’t miss interactions or messages because they will be sent to your personal email as well as your dating inbox. If singles are less tech savvy, it might be worth getting a friend or loved one to help navigate the site the first time, just to show users where all the different features are. FAQ pages are usually available and can answer most common queries. Searching through thousands of singles in any given area can be exhausting, so look out for powerful search features. These can vary from filters such as physical appearance, lifestyle, income, education and religion, to more specific tools like a keyword or a username search. Most sites will offer some element of matchmaking, such as daily matches who users may have missed in the search results, personality quizzes, compatibility tests and more. Because MatchSeniors offers both online and offline dating capabilities, there really is something for everyone here. The site is targeted at singles aged 50+, offering the opportunity to find love again by using the powerful world of online dating. It takes moments to find out what the best online dating or offline matchmaking options are in any particular location, so users have nothing to lose checking out what’s on offer for them.